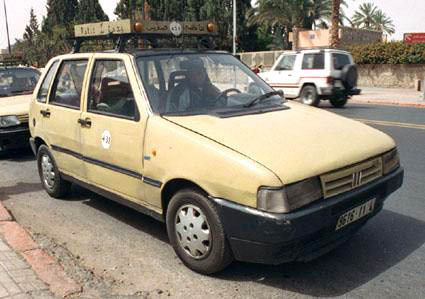 There are two kinds of taxis in Marrakesh: The petit taxi are econo cars (often Fiat Uno, Peugeot 205, Renault Clio) that can be caught anywhere about town which are intended to transport 2-3 people. Since there are no meters in the taxis, it is best to agree upon the price before getting in. The average price is around 10-15dh (equiv. to $1.10-1.65 USD) for trips within the city. The prices go up to 15-20dh (equiv. to $1.65-2.20 USD) during the evenings. Naturally, you can expect to pay a bit more for trips outside the city. Tourists often tips at the end of their ride, though this is not standard practice in Morocco. The other type of taxi is the Grand Taxi, which typically are old Mercedes cars that carry 4-5 people. They leave from busy places such as the bus station, Jemaa-el-Fna or from the post office in Guéliz. Fares in these taxis are roughly 5Dh or roughly $0.55 USD. If you're wanting to hire a limousine for a special outing, you can hire one from Travel Link at (044) 448 797 or stop by their office at 19 Rue Mauitania, Guéliz. Limos are considerably more than any form of public transportation ranging from 2000-2800Dh, which is equivalent to $220.58-308.81. These rates are typically for an 8 hour tour, though prices will range largely by the type of limo chosen.